The bhangra was a seasonal (wheat) harvest dance that was performed only by men at the festival of Vaisakhi in the Punjab region of the Indian subcontinent. The original diluted since 1947 by relocation of millions of people. 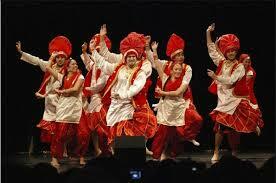 In the 1950s it became a new folk dance that was exported by Punjabi emigrants to other countries. Since 1990 followed a merger with Western dance styles (and music), and annual dance competitions at colleges and universities in Canada and the US. In Britain the Indo-Pakistani expatriate community made of bhangra a clear symbol of their own ethnic identity. The dance evolves from harvest festival to a fixed part of wedding receptions, birthday parties, local fairs, and other celebrations. Bhangra dance is (often with Bollywood dance) a fitness dance. Bhangra is a beautiful, expressive dance, infectiously energetic, full of exuberant joy. The original dance movements refer to the work on the land: plowing, sowing and harvesting. Several dancers perform powerful kicks, jumps and twists, sharp movements of shoulders and hips, stamping feet, waving their arms and clapping the hands. The circle dancers make regularly spectacular and acrobatic solos. Bhangra singers use a high, energetic tone. They sing fierce and proud, with many nonsensical, random noises. The dancers yell hi, hi, hi to the beat, screaming loudly balle balle, oye hoi, bruah ... as an accompaniment to the rhythm that is heavy and hypnotic. A drum roll often marks the end of a song (line). The last sentence is then repeated by the dancers as a choir. Melodic bhangra makes use of little notes, rarely an octave. The dhol (double-headed drum) is beaten with a heavy beater and a one lighter stick on the other side. This important and typical instrument creates the characteristic swinging and rhythmic character with lots of syncopation. Traditionally, men wear a chaadra, a piece of cloth that is wrapped around the waist. Then a kurta, a long shirt and of course a Pagri (Turban) on their heads. Women like to wear a traditional Punjabi salwar kameez dress, a long wide pants that closes tight at the ankle (salwar) and a long colorful shirt (kameez). They also carry chunnis, colorful canvases that are wrapped around the neck. Daan Kara - performed with sticks, often at weddings. Dhamal - particularly energetic form in a circle with hands in the air and lots of shouting. Gatka - with swords, daggers, or sticks. Giddha - This is the woman dance. Jhumar - men dancing at weddings and other celebrations with a rhythm that is significantly lower. Julli - can be done by a single person, even from a sitting position. Kikli - usually hand in hand through pairs of girls or women. Luddi - the dancer has a hand behind the head and the other hand stretched out. Saami - is usually considered to be a woman dance.